The Tibor de Nagy Gallery is pleased to present its second exhibition of paintings by the celebrated Icelandic painter Louisa Matthiasdottir. The artist is known for her realist paintings that employ a vibrant palette and a strong geometric structure. The exhibition will comprise a selection of small, loosely painted landscapes, some of which were created as studies for larger paintings. Now considered a national treasure in her native Iceland, the artist was a prominent younger member of country's first avant-garde. She went on to study in Paris and Copenhagen, and eventually moved in 1942 to New York where she studied under Hans Hofmann. Along with a group of fellow former Hofmann students, including Robert de Niro, Larry Rivers, Nell Blaine, and Jane Freilicher, she helped to foster a new sense of relevance for representational painting. The artist's work has been exhibited and collected widely throughout the United States and in Iceland. Her paintings are included in many private and public collections, including the Tate Gallery, London, the Art Institute of Chicago, and the Hirshhorn Museum and Sculpture Garden. 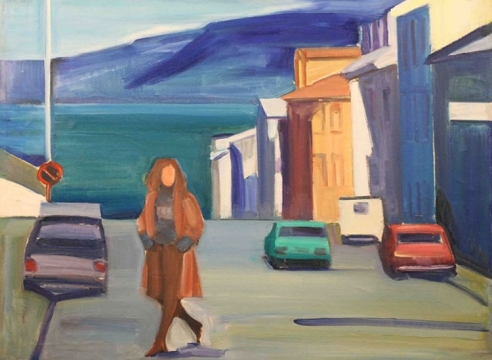 In the spring of 2009, the artist's work was the subject of an exhibition at the Reykjavik Museum.